- All in-stock orders ship same day when ordered by 12:00 PM Central Time - Monday-Friday. - If something is back ordered, we will contact you by email or phone. 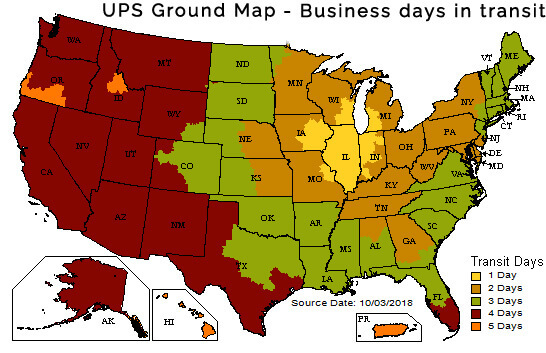 - UPS® will not deliver to a P.O. Box. Please supply a physical address. - Some items will ship from the manufacturers warehouse closest to the customers "Ship To" address. - Signature will be required on all orders of $120.00 on up. Note: UPS® will not ship items weighing over 150 lbs. FedEx Truck freight will be used for items over 150 lbs. Charges for truck freight shipping may not be able to be calculated online, but you will be notified of shipping costs as quickly as possible and will be charged only after your approval is obtained. Freight charges will vary depending on item(s) and shipping destination.